I've made progress on this mess of embroidery thread that I mentioned last week...or was it the week before? I sat down yesterday and finished winding the last of my thread onto those tiny little cards. For at least a moment in time, all of my thread is organized, in color order, and looking oh-so-pretty. I have so many project ideas swimming around in this little head of mine. I have a couple pages of notes, full of ideas and colors and inspiration. But when the time comes that I have a few minutes to write or work on something, I just don't. Maybe I'm burned out, maybe I'm just completely exhausted, maybe I need to find away to add 8 hours to the day. I do have a couple of things I would like to share. 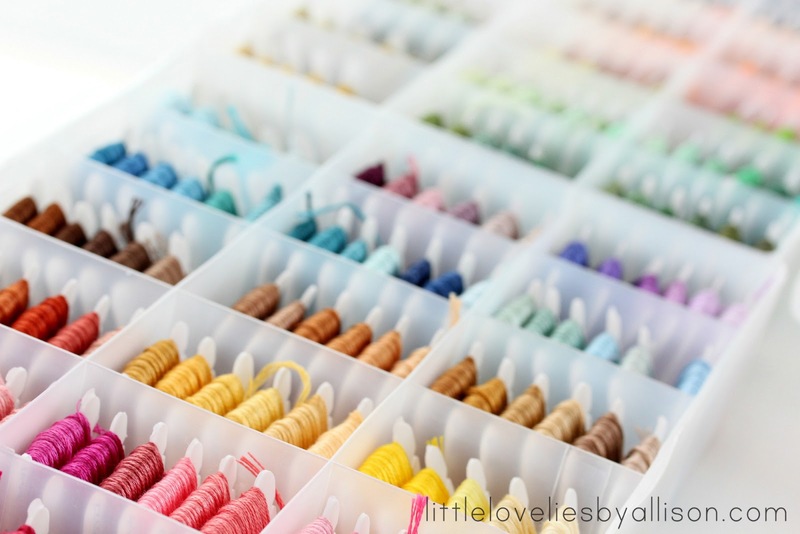 I am planning on doing a craft room update post answering some frequently asked questions and responses to a couple of comments that I have seen on Pinterest about my room. I am also planning on doing a how to cross stitch series. Every time I post one of my cross stitch projects, I get so many comments from people who say they wish they knew how. It's easy and I think with a few pointers and tutorials, anyone can do it. But for now, it feels good to get something done, even something as small as organizing embroidery thread. 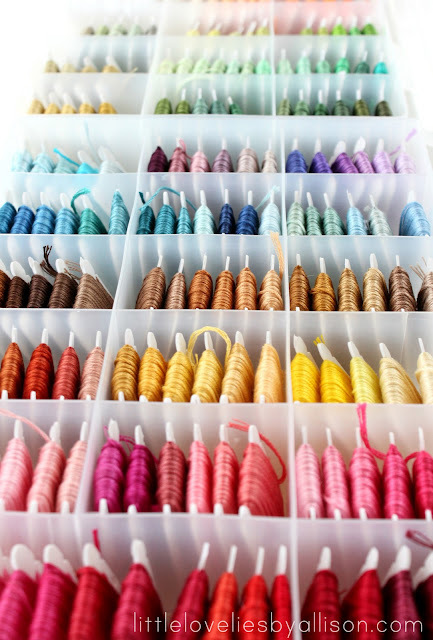 Love seeing all those colors lined up...and really can't wait to learn more about cross stitch from you! I totally hear ya -- sometimes you need those free to minutes to just relax. It's how we know we need a break, I think. I cross-stitched forever so I have three of those cases full of thread. I know what you mean about having to wind them up. Whew! I'm super excited for these future posts! I love cross-stitch, but can always use a few pointers. 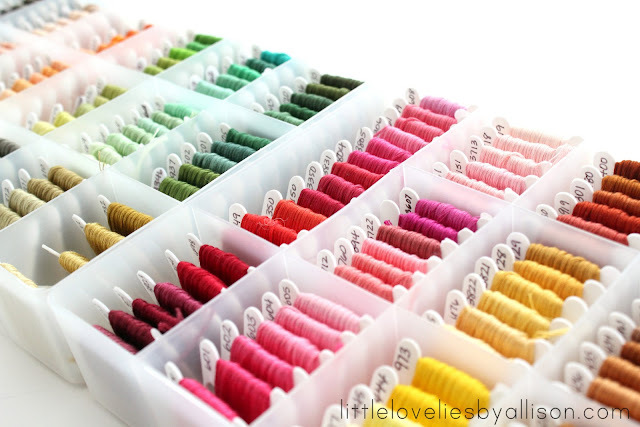 And we can all use ideas for organizing our craft spaces. Can I add to your list and ask how you took such insanely amazing photos of your floss boxes? I mean, these should be on Etsy and sold as prints! this is probably a stupid question but: have you made those little cards, or you can buy them somewhere? 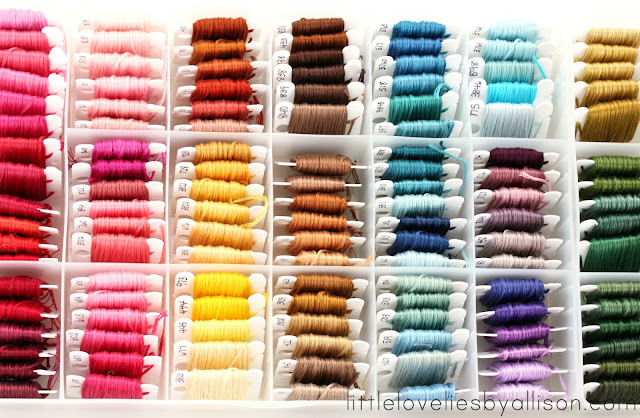 You can buy them at Michael's or JoAnn or Hobby Lobby - pretty much anywhere where they sell embroidery thread. your organization is great. It will help in the long run. And yes we all need to do something else sometimes for a change so we can go back refreshed. Gosh all the colors are amazing!! Love this! It's so pretty and organized! It sure doesn't look like a small task. Looking forward to your craft room update and cross stitch series!